Burning incense and candles for long has been a part of religious ceremonies and rituals in Hinduism, Buddhism, Christianity and other major religions of the world. The pleasant aroma emanating from the smoldering incense sticks might send you into a state of ecstasy and trigger the spiritual mood in you but did you know that it causes the release of some harmful pollutants that is hazardous to your health? According to a study in Taiwan, burning incense exposes people to dangerous levels of smoke laden with cancer-causing chemicals. Levels of polycyclic aromatic hydrocarbon (PAH) called benzopyrene, which is thought to cause lung cancer in smokers, was found in very high quantities inside a badly ventilated temple in Taiwan. BBC Health reports from the findings of the researchers at Maastricht University, Netherlands: Respiratory health is increasingly at risk from so-called "indoor pollution" in the home, workplace and other enclosed spaces. Church air, with the long hours of candles and incense burning was found to be considerably higher in carcinogenic polycyclic hydrocarbons than air beside roads travelled by 45,000 vehicles daily. December, with churches lighting up candles for Christmas, could be an especially dangerous month for the lungs. While the delightful smell from a burning scented candle could tickle your olfactory nerves, it could also spell big trouble in terms of your health. A Florida study reveals that soot particles from scented candle burning not only causes ugly blemishes around the home but also poses health risks. A Michigan study shows that some candles available in the market are made with wicks that have either lead or lead cores that emit potentially dangerous levels of lead into the air. Even unscented candles aren't exactly safe because most of them have paraffin, a petroleum waste product which releases carcinogenic chemicals when burned. An occasional paraffin candle and its emissions will probably not affect you, but lighting many of them every day for years, or lighting them frequently in an unventilated rooms, may cause problems says Dr Amid Hamidi who led the study in South Carolina. So if you just can’t do without burning incense or candles at home, either for religious reasons or for masking household odors and unpleasant stench, at least ensure that there is proper ventilation for free circulation of fresh air by keeping the windows and doors open at that time. Instead of scented candles make do with unscented ones made without petroleum and with wire-free wicks. For your aromatherapy, rather than using aromatic candles try using diffusers which are proven to be safe. By the by, even sprays or air fresheners are not safe, so don’t even bother to use them, they could raise your risk of getting asthma. Thanks for sharing with the Carnival of Family Life- Bonfire edition. An excellent reminder. Very informative. I have asthma so I don't usually burn any candles or incense in my home. Thank you for this article. It was sure worth the read and very interesting. I for one would never have thought incense had a link to cancer but on thinking about it and reading this all types of smoke can have its dangers to your health in one way or another. What a good article. It seems logical as it is smoke. Who before this study has made the connection to cancer. Not me. I have a friend that has recurring skin cancers and loved to burn incense. Since you published that article he has stopped using incense and is also aware of other smoke in his surrounds. Thank you. Depends on the quality of the incense. Some cheaper kinds still have a thin wire of lead to keep them burning, others use magnesium. As for the smoke, I'd imagine that it's not the greatest for your lungs and eyes...probably better to burn it and leave the room, then return when it's done burning. As for my favorite, Nag Champa...it's a nice rich woodsy smell with sandalwood. well, you're filling your air with smoke, so that doesn't sound very healthy. I think we have to be careful not too blow the risk out of proportion since all risks should be considered relative. On-line resources cant always be trusted and shouldn't be unless qualified with proper evidence from a reputable body. well actually it is perfectly fine if you leave the windows or door open, get some fresh air don't just stay there, and don't abuse the amount of incense you burn. It is, it causes the same damage as smoking. It's not a good idea to use incense every day; I personally avoid it altogether. If you must use it, keep a window open. The relationship between incense smoke exposure and cancer risk appeared to be dose dependent in this study which adds additional credibility to the findings. Those who burned incense regularly in their homes were 80 percent more likely to develop cancers of the respiratory tract, such as throat and nasal cancer. Never go with your nose above an incense stick. The effect is contrary cause the nasal organ freezes so that you will perceive nothing. Just let the smoke dissolve itself quietly through the space, and when it is a good incense you'll notice soon how the atmosphere changes through it.Take care for good ventilation while you are using incense. Of course it is fun so now and then that the whole room is full of smoke, but limit these occasions to the very special ones and take care that there is always a little window open. By the way, Oxygen is really good smelling! When you are allergic for essential oils I recommend you not to use incense. 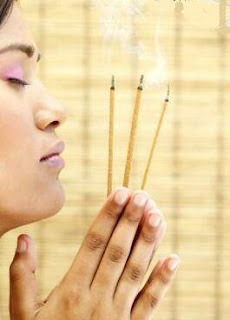 Most incense from the shops is a blend of wood, charcoal and perfume oils and especially the quality and the composition of the oil have a connection with health. With biological oils you might be able to withstand those better. The incense sticks that I sell on this site only contain natural substances, are biological in that respect, but for the same reason produce slightly more creosote. Stick on a charcoal base have that less. When you are liable to have asthma I recommend you to limit your enjoyment of incense to a minimum. It isn't going to cause any immediate health problems, but it isn't healthy. Kind of like cigarettes, after a while, they can deteriorate your health. And Marijuana is a safer alternative, albeit Marijuana is illegal and I am not suggesting any illicit drug use. Incense burning may pose some health concerns. Because incense is a slow burn, many believe that it gives off a lot of chemicals such as carbon monoxide, aldehydes, and respirable particles. They are of considerable concern because these particles are both upper respiratory and pulmonary system irritants. This means that they can inflame mucous membranes, and cause asthmatic attacks in sensitive individuals. It's just the same as an other smoke. I suppose if you burnt it a lot it could have the same effects as cigarette smoke, but the result of it causing lung cancer is slim to nothing.